Corona - Service Areas - Services - Allied Commercial Real Estate, Inc. The City of Corona is located approximately 45 miles southeast of Los Angeles in western Riverside County. The City limits encompass 39.2 square miles and the population is approximately 147,428. A city whose heritage spans more than a century, Corona has emerged as an ethnically diverse community, where a significant percentage of the population is made up of young, well educated families. 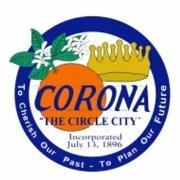 Corona's industrial base has played an important role in the growth of the city and its employee base. Corona's economy is strong and getting stronger! More than 82,000 people work here. Our retail and commercial areas are expanding and office development is booming. Corona has more than 30 million square feet of industrial space and more than 3 million square feet of office space existing, under construction, or planned.